If you have read any of my other blogs I have focused on my grandchildren, and this one is no different. My oldest granddaughter, Mackenzie (Kenzie) now 5, has been having some sleeping issues. My daughter, Emily, had recorded her snoring in her sleep and shared it with their pediatrician. The pediatrician was very concerned as it was very well pronounced and indicated that her airway was being compromised by her tonsils and adenoids. Kenzie was referred to an Ear, Nose and Throat specialist and it was confirmed that both her tonsils and adenoids needed to be removed. Kenzie listened to the diagnosis and the recommended procedure. Emily and the doctor discussed with Kenzie what would be best for her and what it would involve. Kenzie was on board and wanted to know when they could be removed. The procedure was scheduled two weeks out. Now one should remember that Kenzie just turned five and is in preschool. Time concepts at her age are days of the week, months of the year and the next holiday to celebrate. So, saying two weeks was still somewhat abstract to Kenzie. When they got home, Emily made a countdown calendar to help Kenzie with the timeframe, so she would have a better understanding of how many days would come and go before the procedure. From that day on Kenzie was treating her upcoming procedure as if it was a holiday to celebrate. Her anticipation of what was going to happen was almost truly unnatural. As adults, we know what is involved and some know firsthand what this experience is like. My youngest daughter, Sarah, had her tonsils removed at the age of twelve and post-surgery was tolerable but still somewhat uncomfortable. My personal thoughts were, “Oh child you have no idea…” but Kenzie was so excited to share that this was about to happen. A couple days before the surgery, Emily tried some of the post-surgery foods with Kenzie. Jell-O, pudding, ice cream and popsicles and Kenzie had no issues with that. The night before everyone was given their designated duties; Mimi and Pappy Pa were instructed to take care of Ethan, our 2-year-old grandson. Kenzie had her special pajamas and off to the hospital they went. Emily would send pictures and a timeline as to what was happening and Kenzie was still all smiles. The procedure went well and when Emily and Jamie went back to recovery, Kenzie was sitting up as if nothing had happened, all smiles. For any parent, the last thing we want to do is see our children in discomfort, but that wasn’t the case so far. Fast forward 4 days and really nothing has changed except for the snoring. Kenzie has not had one complaint to speak of, which is quite a relief to all of us. There is something to be said about the attitude one brings to the table and how we perceive what it is we expect. Kenzie’s lack of knowledge as what to expect was natural. What helped her to be prepared was the information and honesty about what to expect in real terms and that in the end, the outcome would be in her best interest. So, what does this have to do with education or anything remote? On the verge of any testing, what can parents and teachers do to help prepare their child or student for any anxiety that might confront them? PATINS hosts a PATINS/ICAM Twitter Chat on Tuesdays at 8:30 EST. (#PatinsIcam Chat) to tweet and chat about topics that pertain to education. It just so happens that the Tuesday of this blog the topic dealt with creating and maintaining a positive test environment. It paralleled what we experienced with Kenzie to a degree regarding preparation and expectation. Below were the Twitter questions for the chat. I am not going to address the questions but through Kenzie’s experience, it’s food for thought. Why is creating a positive testing environment important? What behaviors can be seen when a student struggles with test anxiety? What strategies do you use to create a calm and positive atmosphere? How can students support one another when it comes time to testing? What are your favorite apps or extensions to support students who may be feeling anxious? How can you gain parent/guardian support for creating a positive perspective of testing at home? What strategies and accommodations have you been implementing throughout the year to improve your students' confidence and access to the curriculum, thus improving test scores? How can goal setting factor in to helping a struggling child feel successful with ISTEP? Does teacher stress feed into student anxiety about a test? How do you take care of yourself? How are you going to celebrate this round of testing being over? Kenzie would say pudding, popsicles and ice cream for this one! Great blog post! My 23 year old daughter is having this done in July, I hope she does as well! It’s that time again for me to blog. If you have followed any previous blogs that I have submitted, you might see a pattern. This one is no different. I have been enthralled with what my grandchildren have shown me as they develop. It is always a surprise to see the growth every time we get together. Let me first forewarn you that what I am about share might sound scary and, frankly, a little unnerving unless you are somewhat of a risk-taker. My youngest daughter and son-in-law have three children, two of which I featured in my last blog, Dean and Logan are seven and five respectfully. The youngest is Hazel, a fearless child, that has made every attempt to be as much like her older brothers as possible. My wife and I were seated in our kitchen one afternoon. Her phone dinged indicating there was a message. She picked it up, looked and shouted, “Oh my gosh, what are they thinking?” She shook her head with her mouth open. “Look at your granddaughter,” she said as she passed me the phone. What I saw was Hazel in their backyard tree some 15 feet off the ground and my grandsons some branches below. An aside here, with all the technology available to kid these days, my daughter and son-in-law have encouraged their children to spend as much time outdoors getting physically active. Both parents were raised that way. Back to Hazel however. We called my daughter at my wife’s encouragement to make sure someone was closely watching her. Hazel seemed to be having fun, and we were reassured that they were keeping a watchful eye on her. So, what’s that got to do with the earlier warning and my wife’s concern? Hazel just turned two years old in September. She had no problem climbing or getting down. It was a personal accomplishment, though a little frightening for us, but not for Hazel. What I took away from this experience was that even though Hazel is two years old, she had the confidence to climb the tree because her brothers had shown her how. She had her parents’ reassurance that they were there if she needed help. She was offered praise and encouragement for her accomplishment. Hazel is determined to not let failure get in her way. Among other things, building personal self-esteem in students is as important in the classroom as it is outside of the classroom. They need a chance to succeed by placing focus on their strengths and not so much on their weaknesses. For some students, what they risk in the classroom is not the same risk that Hazel took, but it is just as powerful on another level. Student confidence is extremely important as it encourages them to move to the next goal. Maybe they are somewhat reluctant but knowing what they have accomplished before can carry them on. Of course, there will be circumstances that will demand courage to meet the challenges with determination but with the proper support, encouragement and enthusiasm, anyone can reach for that higher branch. Summer has come and gone for many students around the state, and it’s back to school. New experiences, new friends, and new teachers. One must think of what each one of those students brings to the classroom. That thought struck me this summer when we were on our family vacation. As with one of my blogs last year, I got to thinking about interactions with my grandkids as inspiration. This summer was no different. My wife and I, joined by my two daughters and their families, have made it a tradition of going to the Outer Bank of North Carolina. It’s warm, relaxing and a nice way to finish the past school year and begin the summer. Each morning we like to pack up the kids and head to the beach for the day to play in the sand and surf. We encourage all five of the grandkids to play hard but take time out to rest when they get hot, tired or hungry. This year, my oldest grandson, Dean, who is 7, took time to sit and rest next to his mom and chat. The sun came and went from behind the clouds and Dean started watching them. “Look, Mom, that one looks like a dog,” I heard him say. Back and forth they went trying to figure out every cloud that passed by. It wasn’t long before Logan, my 5-year-old grandson, joined them. Logan listened to them describing what they were seeing. He would glance at the sky and squint searching for what they were observing. “Right there. It looks like a Pokémon,” Dean said. “Where? I don’t see it,” Logan replied. After listening to a couple more descriptions by Dean and his mom, Logan was on the verge of tears. “I don’t see it,” he said. It wasn’t communicated to Logan that they were looking at the clouds. Logan had missed critical information as to how to play the game. We have all experienced that situation at one time or another when that one key tidbit of information was missing and those around us just assumed we understood. When we get that missing piece, it’s been called that “Aha!” or lightbulb moment. Whatever you call it, it’s that realization of understanding what was missing. For Logan, it was simply the clouds. I have to wonder how many students come to school with just a few missing pieces here or there. It’s our place to help them find them through listening, encouraging questions and watching facial expressions. The reward is the smile one sees when that missing piece is found, and we’ve made a difference. I enjoyed watching my grandsons, Logan and Dean, that day as they sat for a while longer both having fun comparing clouds. Here it is, time for me to blog. It is my understanding, that as a PATINS blogger, I am to reflect on those things in my specialty area. For me as the ICAM Technical Specialist, it involves getting material from the NIMAC, Learning Ally, how to deliver digital content and what to do when it just doesn’t seem to go as planned. Anyone who has followed my other blog postings probably didn’t absorb much of that content. I prefer to be a little more whimsical in my writing. I enjoy sharing more on a personal note just because it’s my blog! On Easter Sunday, we had the whole family together consisting of my two daughters, their husbands and my five grandchildren. We enjoyed the traditional stuff that we have always done like an Easter egg hunt, Easter baskets, a big dinner, etc. Everything went off without a hitch. What was different about this Easter was the interaction and independence of the grandchildren. Ranging from one and a half to seven, each had a very different way of experiencing the festivities. Sure, age had something to do with it but it was how different each one got to the same or similar level of enjoyment. What I noticed that day was even at the most earliest of ages, each child had their own way of discovering, sharing, cooperating, conveying their excitement and disappointment in ways that were not directed by adults. What I saw was an unspoken use of Universal Design OF Learning. Each child using their own talents and not being told what to do be it right or wrong, but enjoying the moment. I am not the type to spoil the rest of the song, but I think it’s worth listening to because it sums up just how to incorporate UDL into any classroom, as well as our lives outside of the classroom. As I listen, I gotta say…Thanks, Harry! Last summer on our family vacation my daughter brought along her Amazon Echo. She set it up in the main living area and said, “Dad you need to get one of these." This went on for about an hour. It was impressive even when Alexa didn’t know the answer or request the Echo said so with, “Hmm, I don’t know the answer to that question." Not many people will fess up to that. Alexa was busy all week playing music, responding to joke requests now and then and miscellaneous questions to stump the Echo. When I got home I didn’t rush out to get an Echo although it was tempting. You see I like technology and most of all gadgets, but I looked at the price and thought I’ll give it some time. Sure enough a few months later my daughter texted me to let me know the Echo was on sale. Temptation took over and I ordered one. It was delivered and I set it up, got it connected to the Internet and started asking requests like I had no idea of facts or music. My wife and I rambled on until we looked at each other and decided we were done…for the moment. One little caveat about the Echo is depending on what name you give it, Alexa, Echo or Amazon you should be aware that if you are within an ear shout of the device and inadvertently say the name, it will try to answer you. Most of the time it replies, “Hmm, I don’t know the answer to that question”. Fast forward to before Christmas. There were a lot of sale opportunities for the Echo models, one of which was the Echo Dot 2. It is about the size of a hockey puck with a small speaker but the price was about a third of the larger Echo. For as much as everyone seemed to enjoy the Echo, I thought I’d get everyone a Dot. It was a stellar idea because everyone liked them, which brings me to the point of this blog. My son-in-law has a cousin with Cerebral Palsy. She is wheelchair bound and uses a DynaVox device for communication. My daughter asked me if the Echo would work with the DynaVox. If you know me, you know where I went from there. I don’t have a DynaVox, but I did have an iPad. I pulled it out and installed a simple Text to Speech app and started playing. The first thing that you must do is address the device by name and for me that was ”Alexa." When it lights up it is ready for your request. I typed Alexa and my request, tell me a joke. I took my iPad close to the Echo and tapped Speak and sure enough I got a joke. I played around many times with different requests and noticed that sometimes the initial “Alexa” command needed a bit more time before the request could be processed, so I added either a comma or two or a Return entry which put a little pause before the request was spoken. The request should be made with a 5 to 6 second window for the Echo to respond to the request. I have Proloque2Go on another iPad and added an Alexa joke request button to the default "Joke" folder and it worked as well. Here is a short video of what I did with my iPad and Proloquo2Go sample. In theory, any device that lets the user create phrases like I had done on the iPad and Proloque2Go should have access to the Echo’s ability to respond. Every device is different and there might be some tweaking to do. However, the independent interaction of accessing endless amounts of information and entertainment at the request of the user is worth the effort. The Echo can also be linked to control environmental devices like lights, switches, thermostat and the list is growing. I am sure this was not my sole discovery, but if it gets the interest of someone else, it has served its purpose. I will work to get this in the hands of my son-in-law’s cousin. Stay tuned. 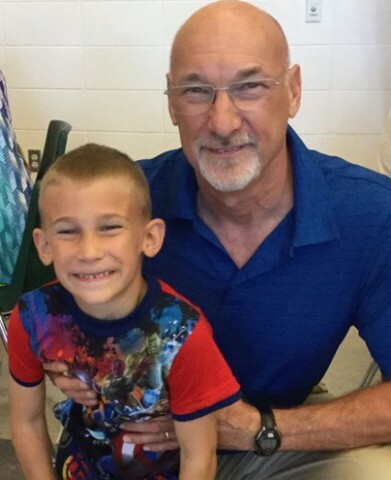 For Grandparent’s Day a couple of weeks ago, I spent the morning with my grandson, Dean. His first grade class had prepared a song to sing for us. After the musical presentation, they proudly lead all their respective grandparents to prepared artwork and individual lockers. A sense of enthusiasm was evident as the students pulled out their iPads to show the elders all they could do. It was at that point I noticed slight bobbing and cocking of heads accompanied by many uh hums. The first graders were flipping through icons and pausing to stop at one and then another, swiping to the left and to the right. The grandparent’s heads kept bobbing and sounds of the uh hums became more obvious. Being one of the senior PATINS staff members, I’ve been around to see technology metamorphoses into a variety of different forms. It started with a handful of cause and effect programs, switch access here and rudimentary AAC devices there. There were big CCTVs and various keyboards. It didn’t seem to change very much over time. However, technology today is expediential in how quickly it is surpassing itself. To me that is mind blowing! Perhaps out of comfort or habit, this senior staff member tends to think “old school”. This old dog sometimes doesn’t mind following through with the same old tricks. It might be as simple as needing a piece of paper to physically hold onto...to connect my mind to something tangible. I’ve realized that many things that have become habit for one may not be an easy habit for others. I have five young grandchildren and every day they are acquiring knowledge that is new and is truly in its simplest form. I have been fortunate to have acquired a good technology skill set over time and I feel confident in sharing that knowledge with them and with others. In my position with PATINS/ICAM, I receive calls, emails and in person requests for the most simplest things. Often, I remind myself that even what one person sees as simple is another’s struggle to understand or grasp. My takeaway is to never underestimate the simple; it might just be the roadblock that might keep a person from moving forward. We live in an age where we experience so much in the digital context. Cell phones, the Internet, news and social media, etc. offers immediate access to content that is at our fingertips. Is that tangible enough for us to absorb in a way that we can fully process all of the content? For some, perhaps not. I’ve bounced around some senior insight, but in that moment of watching the head bobbing and uh humming at my grandson’s celebration of Grandparents, a thought crossed my mind. I don’t think it was the confusion of what the grandparents were seeing and hearing with the iPads. I think it was the amazement of what our grandchildren are experiencing. These first graders made their experiences seem so simple…at least to this grandparent!